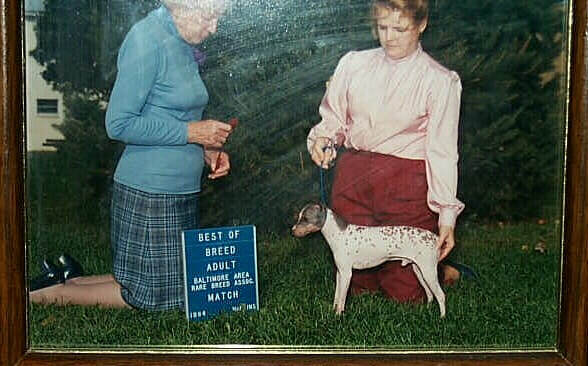 In the autumn of 1972, a small hairless female puppy was born into a litter of midsized Rat Terriers. She had silky, pink skin with large black spots. Not knowing exactly what to do with this different puppy, the owners decided to give her to their friends, Willie and Edwin Scott. Little did they know at the time that this unusual little pup would be the beginning of a new and unique breed. The Scotts named their new pup Josephine, and she quickly caught the hearts of the entire family. She proved to be the perfect pet with her intelligent, lively and loyal manner. Being hairless also meant there were no fleas and no dog hair to vacuum up or brush off. This was a definite plus for the new family addition. They did find out that Josephine's smooth and silky skin would need protection from the hot Louisiana sun. She turned out to be a very bright little dog that loved to travel and make new friends wherever she went. The Scotts treasured Josephine and became interested in breeding her and producing more hairless puppies. 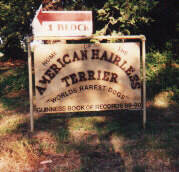 They had owned dogs in the past, but were not familiar with breeding. That wasn't going to stop them, though. With her clean nature, alert and loving personality, Josephine was the perfect house dog and they couldn't imagine owning any other kind of dog. They began to talk about their plans to anyone who would listen, including university scientists. They received the same answer each and every time: "You'll just be wasting your time, it can't be done..." They were told that Josephine was simply a freak of nature and that there was no way that she would reproduce the hairless trait. But Willie and Edwin couldn't take no for an answer and went ahead with their plans to breed her. 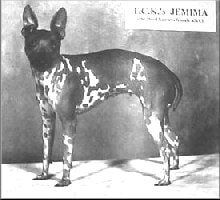 At the age of one year, Josephine was bred to a Rat Terrier (her sire) and she produced a litter of four puppies. Three of the pups were coated, and one was a hairless female named Gypsy. In the years that followed, Josephine had several litters, but none with any hairless puppies. On December 30, 1981, when Josephine was nine years old and still in good health, she had her final litter after being bred to her son. She whelped a hairless male, a hairless female, and two coated female puppies. 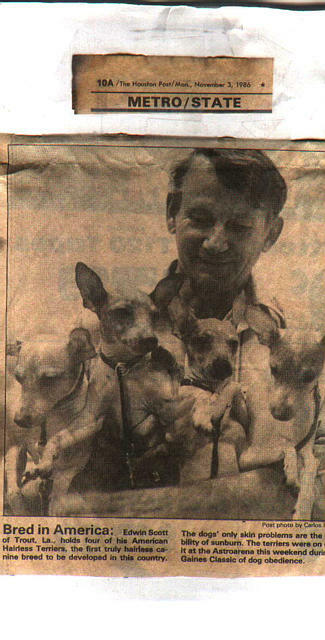 This successful litter produced Snoopy, Jemima, Petunia, and Queenie. The Scotts' dreams were becoming a reality, and on that day they witnessed the birth of the American Hairless Terrier breed.The Scotts were now ready to embark on a full scale breeding program with help from veterinarians. Snoopy was bred to all of his littermates once they reached one year of age. 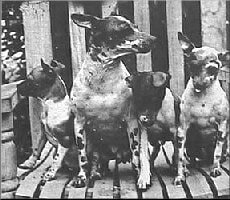 Jemima produced a litter of all hairless pups and the Scotts were overjoyed when Petunia's and Queenie's litters produced both hairless and coated. They kept all of the pups and the house was quickly becoming crowded. They had no choice but to build the kennel that adjoins their house. The Scotts were now on their way and named their kennel "Trout Creek Kennel". Interestingly, the American Hairless Terriers are actually born with hair. The puppies' sparse hair is short, fuzzy, and noticeably different from the hair on a coated Rat Terrier. Shortly after birth they begin to lose this hair, starting at the head and working its way toward the back. By the time the puppies are 6 to 8 weeks old, they are totally hairless with soft, smooth, and silky skin. Their pink skin is warm and usually covered with freckles or small spots. These spots will enlarge with age and darken in the sun. The delicate pink skin does need to be protected from long periods of sun exposure. The American Hairless Terrier is a small to medium sized, well-balanced, muscular dog with a sleek and elegant look. It comes in two sizes, miniature and standard. The miniature stands under 13inches tall. The miniature is 13inches to 18inches tall. They are alert, intelligent, and loving dogs. Their high energy makes them good playmates for children, and their intelligent and loving nature makes them loyal family members. The American Hairless Terrier is different from the other hairless dog breeds native to other countries. 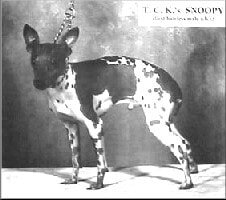 The breeds most often seen are the Chinese Crested, the Xoloitzcuintli, and the Peruvian Inca Orchid. These breeds all have a few things in common: most evident is the hair on the head, feet, and tail on the hairless variety; missing, poor, or weak teeth; and skin problems. The American Hairless Terrier has a strong , full set of teeth, a totally hairless body (except for whiskers and eyebrows), and does not have the skin problems associated with the other hairless breeds. 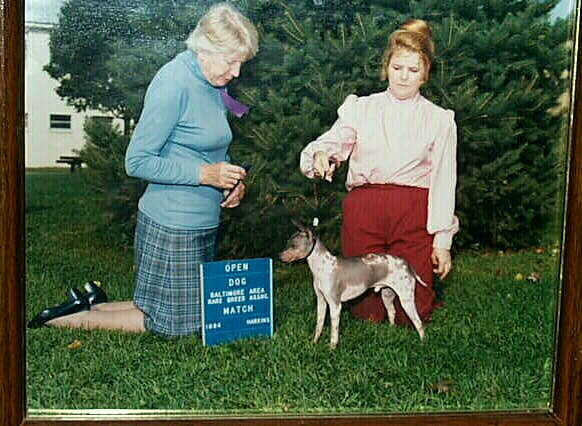 Another difference found between the breeds is that in the American Hairless Terrier the hairless gene is recessive, while the gene for hairlessness found in the ancient breeds is a lethal dominant. New American Hairless Terrier bloodlines are created by carefully planned "out-crossings" to the Rat Terrier. The breeding of two American Hairless Terriers will always produce hairless puppies, while the breeding of an American Hairless Terrier to a coated hairless gene carrier will produce a mixture of coated and hairless offspring. Two coated dogs carrying the recessive hairless gene can produce a mixture of hairless and coated, as well.